Ribonucleases (RNases) are a group of enzymes that specifically degrade RNA. In the lab RNases are used to selectively degrade RNA during DNA purification or in RNA protection assays. In organisms RNases are part of normal RNA turnover and serve offensive/defensive purposes. RNases can be grouped by where they cut RNA: from the ends (exonucleases) or in the middle of the strand (endonucleases) and by their specificity (ssRNA, dsRNA, DNA:RNA,..). RNase A is a single-strand specific endoribonuclease that is resistant to metal chelating agents like EDTA and can survive prolonged boiling or autoclaving. 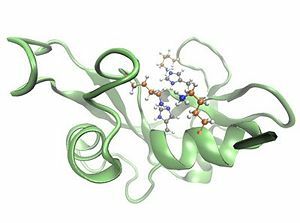 RNase A-type enzymes rely on active site histidine residues for catalytic activity and can be inactivated by the histidine-specific alkylating agent diethyl pyrocarbonate (DEPC). RNase A has been extensively used in sequence-to-structure predictions and folding experiments (PMID 17868092). Ribonuclease H is a sequence-independent endoribonuclease which hydrolyzes RNA hybridized to DNA at the phosphodiester bonds. This enzyme does not digest DNA or unhybridized RNA. In DNA replication, RNase H is responsible for removing the RNA primer. Some reverse transcriptases also possess RNase H activity. Ribonuclease T (aka exonuclease T) is a 3'-exonuclease with sequence preference involved in maturation of tRNAs and rRNAs . It requires a free 3' terminus and removes nucleotides in the 3' to 5' direction. This page was last edited on 7 July 2010, at 14:10.